Taxi Leaks: Joint Founder Of The Fellowship of Hackney Carriage Drivers, To Send Back His Freedom Of The City Certificate. Joint Founder Of The Fellowship of Hackney Carriage Drivers, To Send Back His Freedom Of The City Certificate. I used to be proud of my Freedom of London certificate that hung on my wall. At the moment it is lying on the floor behind my desk, where it has been since the Bank junction ban started. 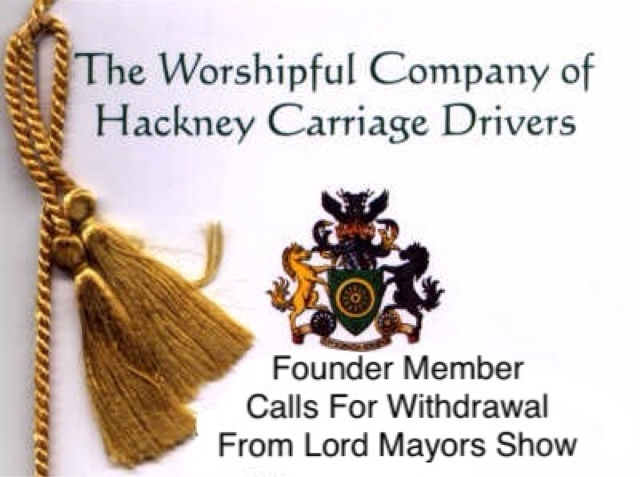 For those that don't know, I was the founder (along with Chris George) of the original Fellowship of Hackney Carriage Drivers. Getting that off the ground took up every minute of my time and nearly wrecked my marriage. I used to be proud of what I had achieved, but not any more. Our trade has served the City for over 400 years and this is how we are repaid - and it wasn't even a taxi that caused the death of the cyclist. Seems turning the junction into a bus lane is too much to ask for. But no doubt the Worshipful Company will probably still take part in the Lord Mayors Show, they may see it as an attempt to win hearts and minds. Perhaps they could even have a float letting everyone know that your taxi has to take the long way round because of the Mayor that is being honoured doesn't want us going past his front door. I gave up being clerk back in 1995 to go to Uni where I studied history and so cannot criticise those who have made the WCHCD what it is today. But what will it be tomorrow? It is in danger of becoming a laughing stock - after all, who will want to join. It never was, nor should be, a political body - we left that to the LTDA and LCDC etc but if I were still Clerk, then yes, I (the WCHCD) would not participate in the Lord Mayors Show. Neither would I attend any function in which the Lord Mayor was in attendance. I would even consider dropping the "Worshipful" from our title - the Watermen and Lightermen's company is not worshipful either. Perhaps I would even consider dropping out of livery altogether - leaving an embarrassing gap at our position as the 104th livery. There is nothing, as far as I am aware, that prevents the company from continuing its good work, Disney etc, just that there has to be no reason why it has to be under the umbrella of the Lord Mayor. Despite the ban, I will continue paying in my monthly donation to the WCHCD charity, but how many members will lose interest and leave? Over the weekend I will be retrieving my Freedom certificate, I will dust it down, put it in an envelope and return it to the Chamberlain's Court at Guildhall, from whence it was issued. My freedom is being eroded. To continue to display it is hypocritical, they can stuff their certificate. Source Dial a Cab FaceBook Page.